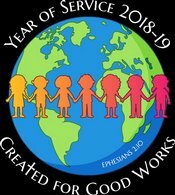 The 2018-2019 Year of Service for the Catholic Schools of the Archdiocese of Baltimore highlights the good works of our students, educators, and broader school communities. This page has been created to share how SJRCS is serving God. Service is at the core of who we are at SJRCS. We are all Created for Good Works!